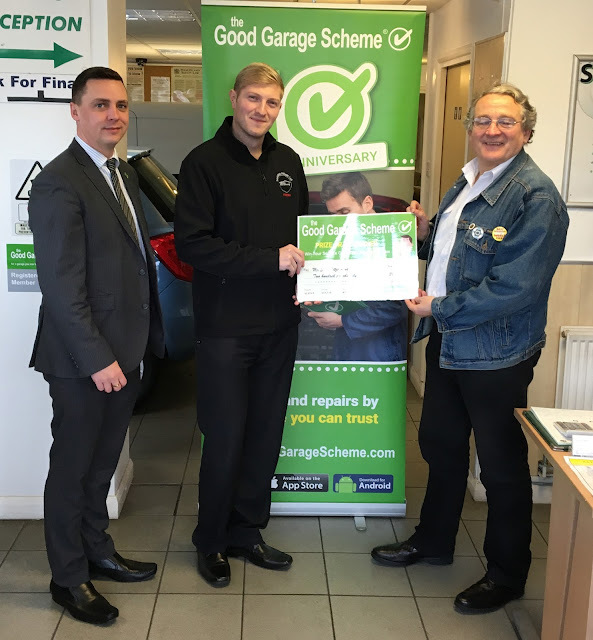 Good Garage Scheme winners find it hard to believe that they have won money back on a car service or repair for simply filling in a feedback card, but that's exactly what happened to Mr Fitzsimons recently at Saunders Abbott garage at Sidcup, Kent. Mr Fitzsimons' feedback was chosen from over 9000 entries in the Good Garage Scheme's national prize draw. "Your garage fixed a reoccurring fault on our previous Fabia. Other local Skoda agents where not even able to diagnose a problem and twice charge me £27.00 to report "no fault found". I will not use them again as they could not fix a problem I had described in detail. You fixed it easily first time!" The Good Garage Scheme has awarded three lucky motorists with this prize so far this year with one more prize draw before Christmas. The next time you need a service, repair or MOT, visit www.GoodGarageScheme.com and read the feedback from previous customers.